Neon orange pants. 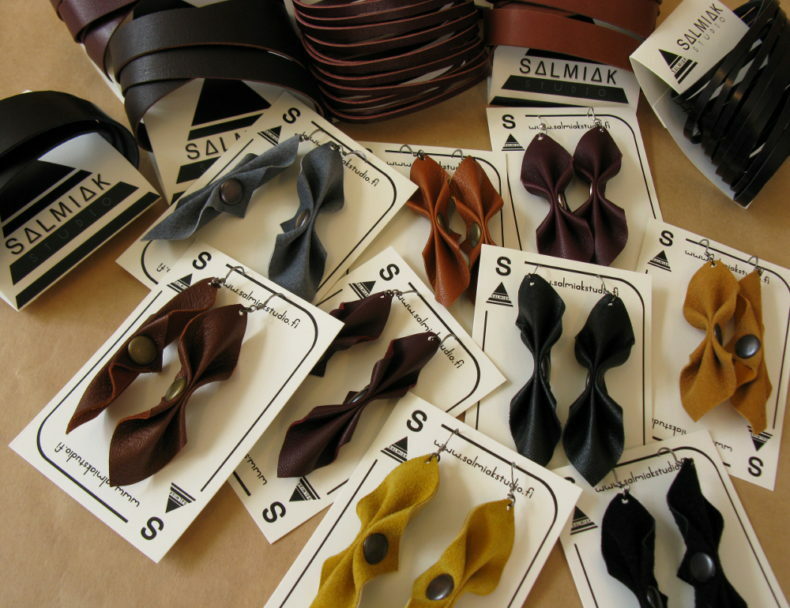 The first pair Kaisa Maansalo, the founder of Salmiak Studio, had ever made herself. It was the early 90’s, and the neon orange pants were soon companied with neon green and PVC trousers. But Kaisa still recalls the feeling after sewing her first pair, the neon orange ones, the excitement and joy she had, the puzzle solved – made by me. The same addictive, enthusiastic feeling, while doing any craft project, has captured Kaisa since childhood, and she used to demand others to show and teach her the skills of sewing and crafts. Kaisa’s other grandma taught her to sew, her other to knit. Kaisa admired both, and especially she appreciated the beautiful wall hangings her grandma used to make. Kaisa still recalls the feeling after sewing her first pair of pants, the excitement and joy she had, the puzzle solved – made by me. Photo by Studio Dettani. It was crystal clear for Kaisa that she would make her passion as her profession. After primary school, she studied crafts and design, learned about weaving, textile design, printing fabric, dyeing and felting. The textile artisan continued her studies at the clothing side. In 2005, it was compulsory to make a garment using leather in the school. As Kaisa had been vegetarian almost her whole life, the idea felt disgusting. Luckily, her teacher gave her an option to use old leather jackets instead of new leather. The jackets, collected from the Finnish Red Cross, turned out to be an interesting material. Nevertheless, it wasn’t love at first sight, and it took a long time to adapt to the idea of using leather. The idea of modifying something old into something new and unique was tempting, though. 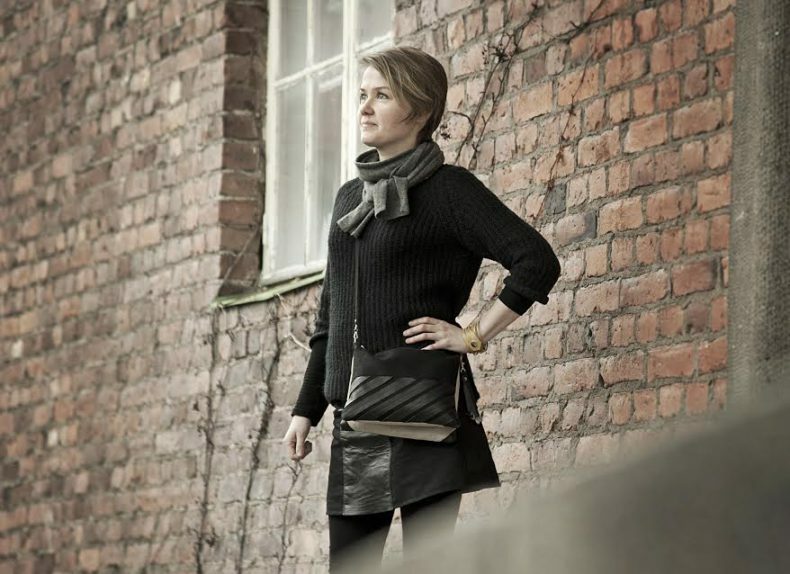 In 2010, Kaisa found the perfect workplace from the former tricot factory of Pyynikki. The big-windowed, small studio has been like a second home ever since. 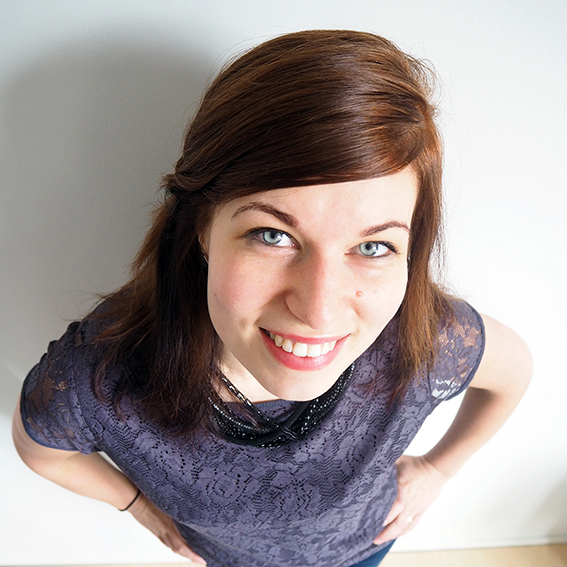 For Kaisa, being an entrepreneur and a craftsman has always been natural choices. She wouldn’t have it in any other way or in that case, Kaisa would be doing something she wouldn’t like. Earrings and bracelets out of reindeer and surplus leather. At the time, she got excited about wall hangings. She bought a few, tried to sew something out of them, but others were too thick and others too thin. Kaisa highlights that she has always thought the fabric wholesales were boring and bland, she found the most fascinating materials from flea markets. After experiments, she buried the wall hangings into her storage. Clothes couldn’t be made out of them. Sewing clothes anyway didn’t feel comfortable, because it soon became apparent that the old leather jackets didn’t bend as clothes. She was enthusiastic to tool them into bags, however. Each one was unique, and the puzzle, putting pieces together, was interesting. She also bought surplus leather and sample pelts from shoe and bag factories, from which she first made jewellery and later bags too. 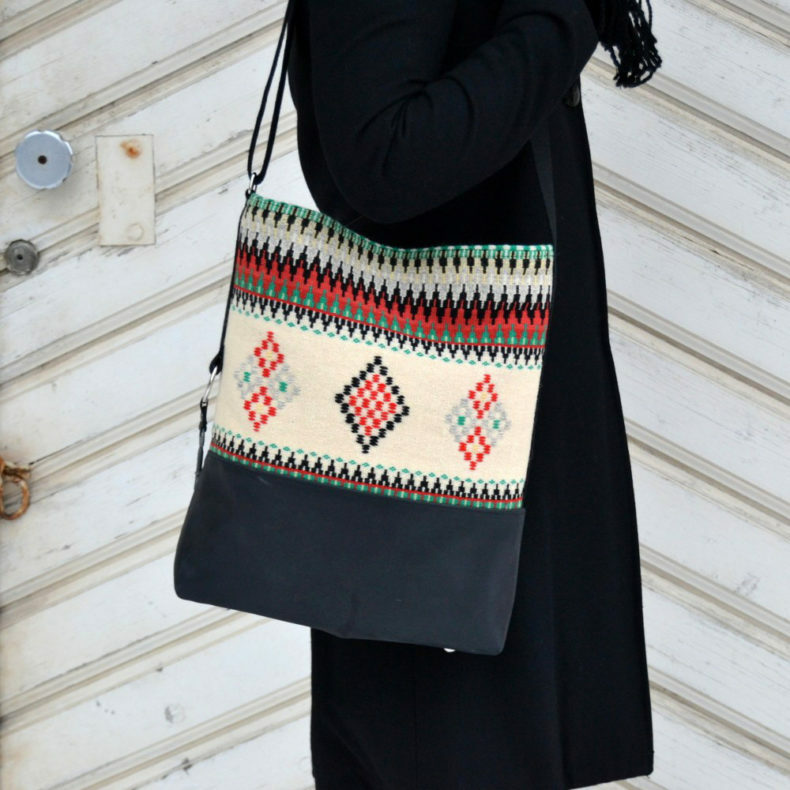 Then, one day she was browsing a web store and pumped into clothes and bags, which were made out of native people’s textiles. In the Revontuli bags, both Kaisa’s favourite materials are combined together showing that it’s possible to make high quality, up to date and stylish design from recycled materials. Kaisa has always found the most fascinating materials from flea markets. In the Revontuli bags, she combines both her favourite materials – leather and wall hangings. 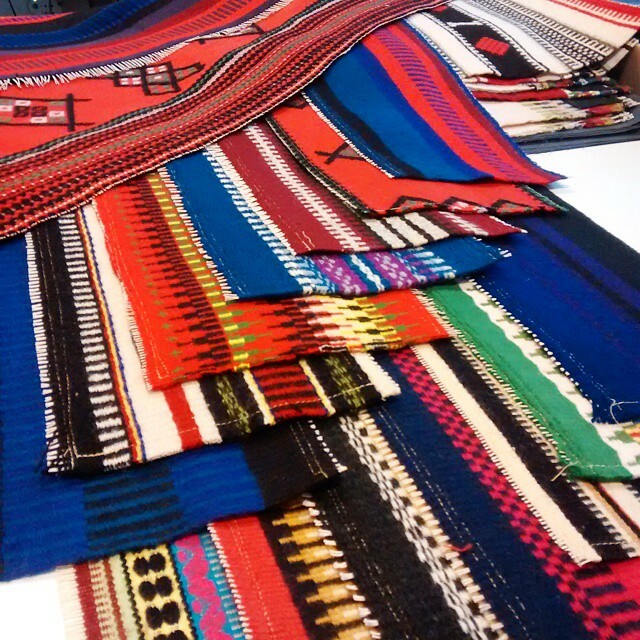 In the Salmiak Studio products, Kaisa has been able to unite both the textile and clothing artisan education with a unique vision. These visions are put into practice in her studio, where the light often shimmers till late night. Evenings are the best working hours, alone when no one else is at the former tricot factory. 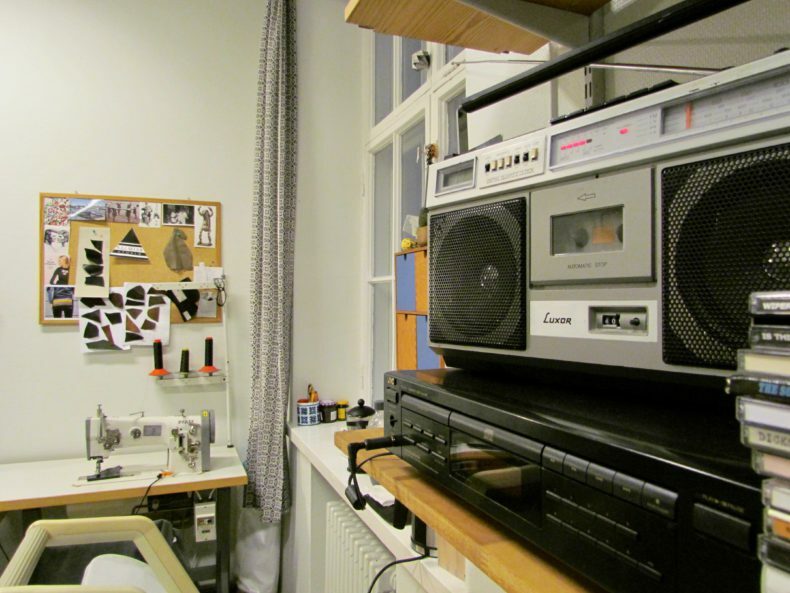 The radio or a good CD is always on at Kaisa’s studio. She enjoys working during the evening. For the first year, there sure were a lot of series and other pieces to sew as Kaisa did everything by herself. She got new product ideas and wanted to have colour variety, and therefore, she also started to use Ahlskog’s factory’s reindeer leather. She also needed a strong material for the bag straps and chose the vegetal tanned cowhide for that. Fortunately, the business grew quickly, and she had to start looking for help in the making of, for example, Revontuli bags and linen products. Now, she uses leather cutting services and linen sewing services, which are located in the region of Pirkanmaa. A dear friend gives a valuable second opinion on all products during the design process. Although, not all days as an entrepreneur are great and often work and design ideas follow Kaisa to museum and gallery visits or cycling trips, her leisure time in general, the passion for crafts is strong. The will to create new stories from materials with a history, the eagerness to learn and experiment new materials, and the excitement she felt after sewing her first long trousers haven’t vanished anywhere. 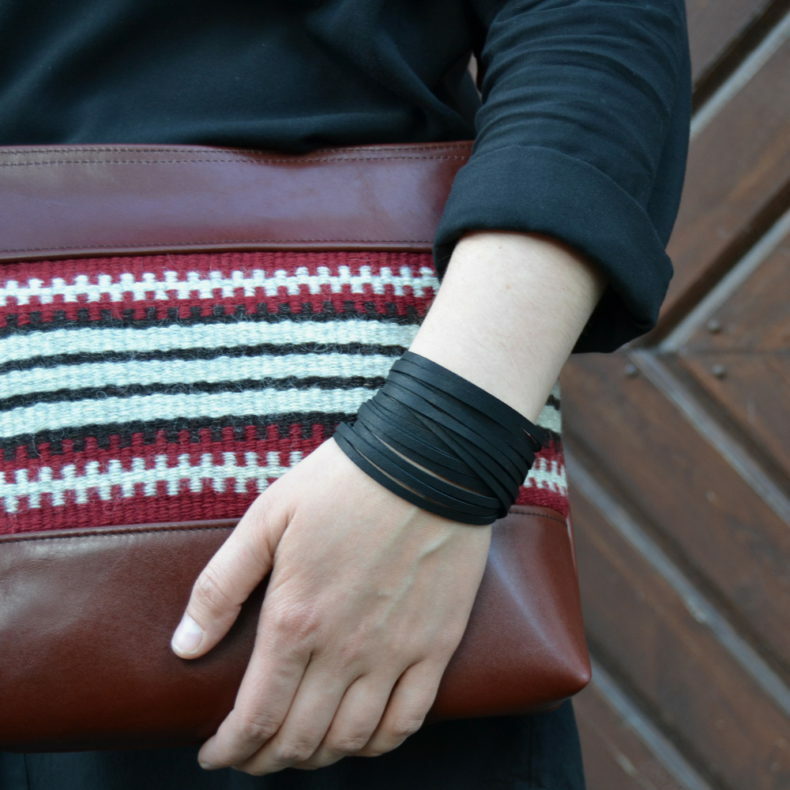 The famous Rotsi leather bag, made out of old leather jackets. Each one is a unique piece.